Let’s just be honest here: the Cleveland Browns need all the fans they can get. They won one game last season. One. So maybe, just maybe, ticking off a bunch of patriotic Americans who’d otherwise root for them isn’t the smartest idea. A local Veterans of Foreign Wars Post in Strongville, Ohio now says it’s refusing to air Browns games on weekends, normally a well-attended gathering for their sports fans, saying they love their flag more than their football team. The announcement comes after about a dozen Browns players knelt in protest during the National Anthem before Monday’s preseason game against the New York Giants, echoing a spreading trend in the NFL started by disgraced – and now unemployed – quarterback Colin Kaepernick. For their part, Browns players who took part in the protest claimed they took the moment to pray for peace. 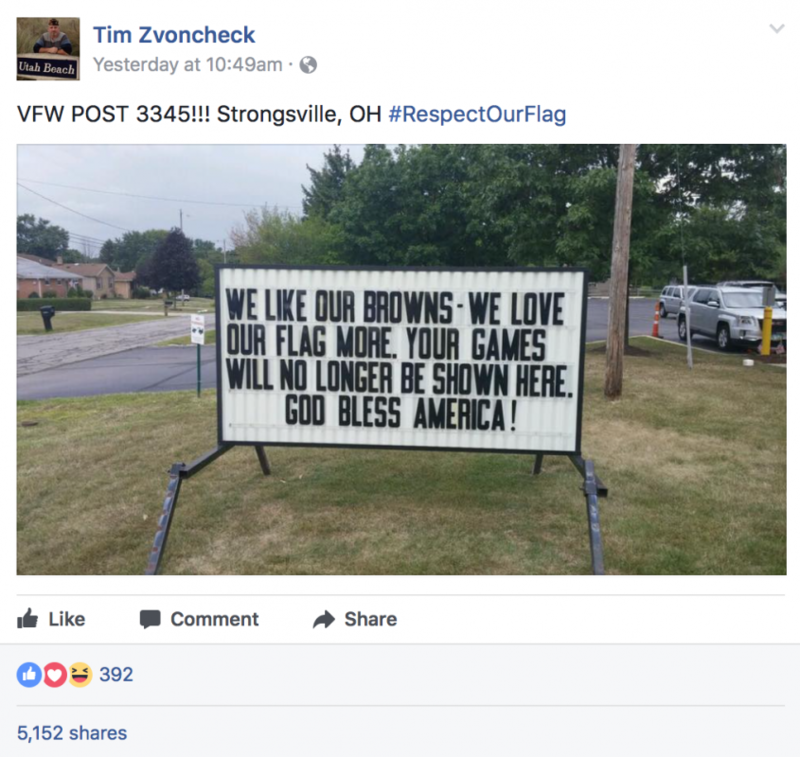 The VFW Post 3345 announced their boycott of the Browns in a Facebook post showing a photo of their road sign, which clearly states that if the National Anthem isn’t welcome at Browns games, then Browns games aren’t welcome at the VFW. So far, the post has gotten more than 5,000 shares on Facebook. Military vets at the VFW Post 3345 told reporters with WTHR they’re fine with the players expressing their right to protest, just as they support their own right to boycott anyone who disrespects the country they fought for – even if that includes their own sports teams. "We fought for the rights of everybody in this country. We joined the military to fight for the freedom of speech and the right to bear arms. We respect that. But it has to be in a manner that we feel is respectful to us as well," explained VFW Post Commander Tim Zvoncheck. Browns players’ decision to kneel during the National Anthem has irked more than just the local VWF members. An Ohio Supreme Court Justice and Vietnam veteran slammed the team earlier this week, saying he won’t be attending any Browns games played by “draft dodging millionaire athletes” that disrespect the flag.